An often-heard official argument is that security responses to protests are necessary because protests are becoming increasingly violent and to ensure the rights of those who don’t wish to protest. Rather than disruption creating the need for security interventions, I will explore the ways in which security actually creates disruption. Responses to anti-austerity protests have become increasingly securitised in the wake of the 2008 global recession, leading to more protests that incorporate disruption and even violence into their repertoires. Disruption has become an important tool for disturbing the 'normal' functioning of unsustainable societies. But all too often, disruption is conflated with violence and limited inappropriately. 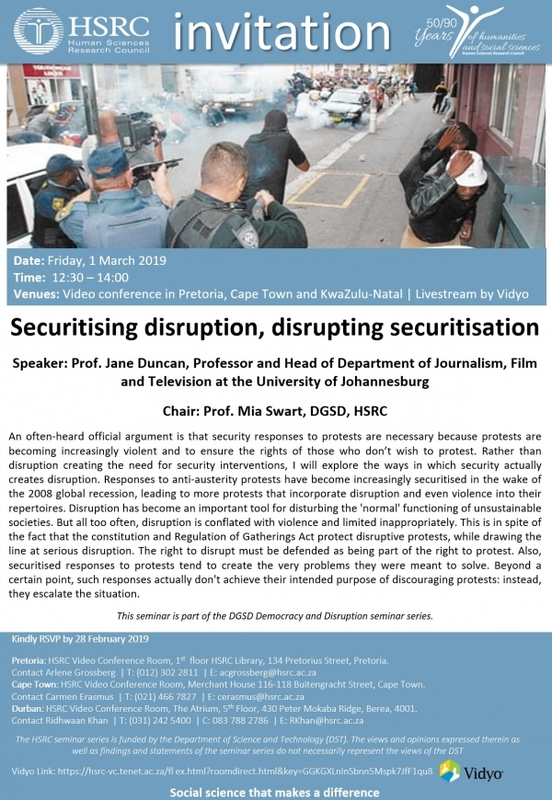 This is in spite of the fact that the constitution and Regulation of Gatherings Act protect disruptive protests, while drawing the line at serious disruption. The right to disrupt must be defended as being part of the right to protest. Also, securitised responses to protests tend to create the very problems they were meant to solve. Beyond a certain point, such responses actually don't achieve their intended purpose of discouraging protests: instead, they escalate the situation. This seminar is part of the DGSD Democracy and Disruption seminar series.